In baseball, football and other sports it is the "home field" advantage. In basketball, it is the "home court" advantage. In professional bass fishing, is there such a thing as a "home lake" advantage? 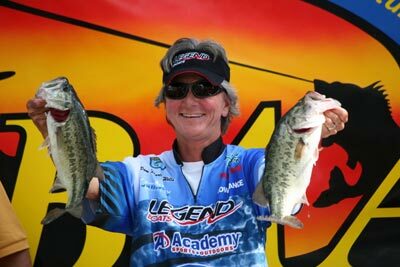 Simpsonville, SC resident, and Lady Bass Anglers Association (LBAA) co-angler Martha Goodfellow sure hopes there is. For if, there is a said "home lake" advantage in bass fishing, she would have it when the LBAA rolls into the Upstate area of South Carolina for the second stop of their 2011 Tournament Trail on May 5-7. "Home field advantage?" Goodfellow pondered with a smile. "I'd like to think I have that here at Hartwell," she added with a widening smile", for I've always thought an angler would have an advantage when fishing their home water". "But for me being a co-angler," Goodfellow continued", some of that home field advantage is taken out of my hands, as I am in the back of the boat and will fish the water and styles of fishing that I need to, based on where my boaters take me and how they fish." She thinks though one of the keys to an angler doing well at Hartwell might be the blue back herring. "The blue back herring can be a big part of the bite even as early as the first part of May," Goodfellow commented. She went on to say that, anglers would probably find bass in every stage of the spawn by the time the Hartwell tournament rolls around. "I feel someone will get on those big ones," she added. "For the winner's two-day weights, it could take at least 35 pounds to win; maybe more for Lake Hartwell is an awesome fishery. The lake level is near full pool and it is a beautiful place to spend the day on the water." One LBAA angler who has spend many beautiful days on the water in many beautiful places throughout our land is veteran pro angler Pam Martin-Wells. Martin-Wells, from Bainbridge, GA. is a true legend as she has been fishing competitively for 23 years, won four angler of the year titles, 15 national championships, and finished 23rd in the Bassmaster Classic in 2010, and been inducted into the Legends of the Outdoors Hall of Fame. Martin-Wells added to Goodfellow's thoughts on the blue back herring. "I think it's going to be an exciting tournament because the herring should be spawning, and this should make it even more exciting fishing," Martin-Wells stated. "I think this should be a very good tournament. I have never fished Hartwell before, but in my research, I think there should be a variety of patterns going on, so an individual will be able to fish their strengths," Martin-Wells added. "As for my goals, I enter every tournament with the intentions of winning. If I do not then I hope I can say I did all I could, gave it 110% and was a good ambassador for the sport," she continued. Martin-Wells went on to speak about the LBAA. "I think the LBAA is heading in the right direction and I have really enjoyed the 2 tournaments we have had so far." "I believe their goals and ideas are what the sport needs to promote women's fishing and ensure a way for other women to get involved," Martin-Wells continued. "As they grow, we will get more women involved, which will in turn get more kids involved. I look forward to the future with the LBAA." Hartwell is a man-made lake bordering Georgia and South Carolina on the Savannah, Tugaloo, and Seneca Rivers. Hartwell Dam located on the Savannah River creates the lake. The lake extends 49 miles up the Tugaloo and 45 miles up the Seneca at normal pool elevation. When at full pool Hartwell encompasses nearly 56,000 acres of water with 962 miles of shoreline. For the anglers of the LBAA, Hartwell goes "off limits" from Monday, April 25 through Saturday, April 30. "Official" practice days are May 1-4 and all anglers must be off the water on the fourth by Noon. South Carolina's Anderson Convention and Visitors Bureau host the two-day ProAm event slated for Thursday, May 5 and Friday, May 6. Pro anglers may bring five legal length bass to the scales and co-anglers may bring three legal length bass to the scales during competition. Competitors during the LBAA ProAm event must be LBAA members. On Saturday, May 7, the LBAA will host the LBAA 2011 Lake Hartwell Lady Bass Anglers Association Salvation Army Boys and Girls Club Charity Tournament. Entry fee is $100 per team with a guaranteed payout of $1,000 to first place. The highest finishing team with a female team member and the highest finishing team with a child age 12 or under will receive a $200 bonus. Membership in the LBAA is not required to fish this charity event. At the conclusion of the weigh-in, drawings for raffle items will take place adding another level of support for the Salvation Army Boys and Girls Club. Numerous national and local organizations have donated raffle items. Anglers will launch all three days at "safe light' and weigh in at 3 p.m. All launches and weigh-in festivities will take place at Portman Shoals Marina 1629 Marina RoadAnderson, SC 29625 Phone: 864-287-3211. Host lodging for the 2011 LBAA Lake Hartwell Tournament is the Quality Inn 3025 North Main Anderson, SC 29621 Phone: 864-226-6051. If you think you want to get into tournament fishing take a look at these tips from one of our Ambassadors.